In his speech Mayor Hogsett focused, as he has for much of his term, on public safety, infrastructure and education. Indianapolis Mayor Joe Hogsett will run for a second term. The Democrat announced his re-election bid during an event Wednesday night at the downtown Phoenix Theatre. Hogsett touted his administration's infrastructure initiatives, its push to hire more police officers and transition to community-based beat policing, and the creation of new educational opportunities as some of the reasons voters should support him again. First to speak at the event was City-County Council President and Democrat Vop Osili. Osili says in the mayor's first term his team focused on fiscal responsibility, balanced budgets, growing the local economy, and making key investments in struggling neighborhoods. Brenda McAtee, chairwoman of the Twin Aire Neighborhood Coalition, says Hogsett’s efforts help struggling neighborhoods around the city. "Our mayor is fighting the root causes of crime, and is making a difference," McAtee says. McAtee's neighborhood will be home to the city's so-called "community justice campus," a new jail that will include a mental health facility geared toward rehabilitation. Hogsett's administration pitched the project as an economic stimulant for the struggling Twin Aire, and as a major component of its push for criminal justice reform. During the event, Jim Merritt, Marion County GOP Chair and potential opponent for Hogsett, sent a statement attacking the mayor's track record. 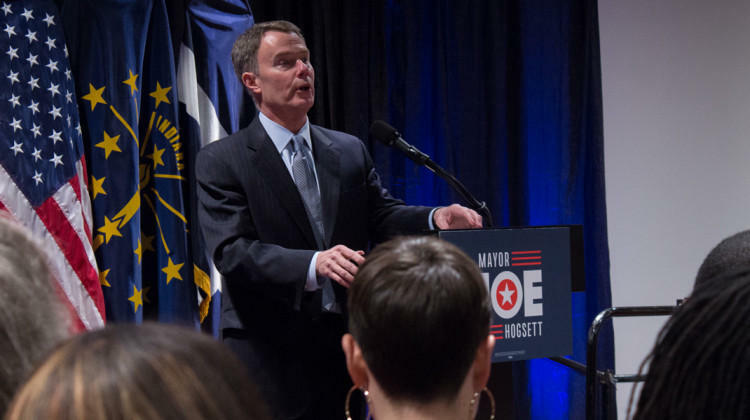 “Nearly three years ago, and with great fanfare, Joe Hogsett became Mayor of Indianapolis," Merritt wrote. "Since then our City has seen our infrastructure crumble and our neighborhoods shaken by record-setting homicides. Sadly the self-described ‘public safety Mayor’ has been anything but." Hogsett's speech was split between highlights of his team's accomplishments and their goals for the future. He focused, as he has for much of his first term, on public safety, infrastructure and education. He says the city is well on its way towards hiring 150 new police officers and transitioning to community-based beat policing, which IMPD leadership says will help bridge the divide between the police force and some high-crime neighborhoods. Hogsett also touted his administration's education initiative for low-income students going to Ivy Tech and IUPUI, its approved plan to spend $500 million on infrastructure over the next four years, and an increase in bipartisan approval, notably the unanimous vote for the 2019 budget, for legislation in the City-County Council. And he talked about his goal to fight against the root causes of poverty, crime and inequality. “Together, we will continue to make strides that not only make our neighborhoods safer today, but which also invest in future generations, breaking the multi-generation cycle of poverty," Hogsett says.